Is There a Food That You Can Eat to Repel Mosquitoes? 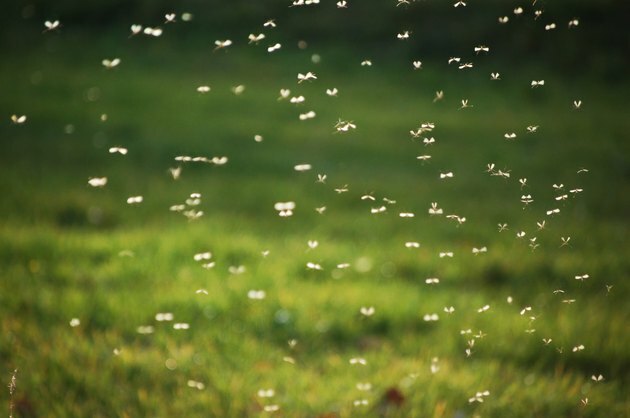 Simple precautions can help minimize mosquito bites and maximize your enjoyment of outdoor activities even during "skeeter" season. Spraying skin and clothes lightly with a commercially prepared solution of DEET provides the most potent mosquito-repelling power, says the American Mosquito Control Association. Repellents containing picaridin or oil of lemon eucalyptus will also effectively repel mosquitoes. While what you eat isn't likely to provide the best protection from mosquitoes, certain foods may help or hinder your cause. According to the Alderleaf Wilderness College, outdoors-people eating diets rich in whole grains, fruits and vegetables have noted that they receive fewer mosquito bites than those consuming more processed and sugary foods. This observation suggests that changing your diet could potentially provide the simplest way to repel mosquitoes naturally. Scientific research hasn't confirmed this theory, though researchers do know that mosquitoes exhibit greater or lesser attraction to particular people due to individual differences in chemical emanations. While garlic consumption has long been touted as a natural mosquito repellent, a study in the March 2005 issue of "Medical and Veterinary Entomology" claims otherwise. Subjects consuming garlic one day and a placebo another day experienced no difference in mosquito bites. Applying garlic externally may provide greater protection from mosquitoes. A solution of 1 percent garlic combined with beeswax and petroleum jelly warded off mosquitoes for up to 8 hours in an Indian field study, says the Colorado State University Extension. According to the Empire State Lyme Disease Association, vitamin B-1, or thiamine, alters your human scent, which may reduce your attractiveness to mosquitoes. This accounts for the popularity of brewer's yeast as a mosquito repellent, since it's high in thiamine. However, a scientific study published in the June 2005 issue of the "Journal of the American Mosquito Association" found that vitamin B supplementation does not effectively repel mosquitoes. Abstaining from alcohol can help keep mosquitoes at bay when you're outdoors. A study published in the June 2002 issue of the "Journal of the American Mosquito Control Association" reported that people consuming beer experience increased mosquito landings on their skin when compared with an abstaining control subject. A study in the March 2010 issue of "PLoS ONE" concurs, citing the body odor of beer drinkers as the culprit in increasing their attractiveness to mosquitoes. Can You Treat Mosquito Bites With Brewer's Yeast? Can Eating Garlic Make Your Skin Smell?